The horrific attacks against innocent people in Paris have shocked and appalled the world. The Islamic extremist terrorist group, ISIS, has admitted ‘responsibility’, and now some are calling for an all-out attack on Islam and all Muslims. That, in my view, would be a terrible mistake. It’s mostly Muslims who are the victims of ISIS; it’s mostly Muslims who are fighting ISIS; most Muslims in Britain and the rest of the world are strongly against ISIS and similar terrorist groups; the vast majority of Muslims are loyal and upstanding citizens. We have to guard against any forms of Islamophobia. 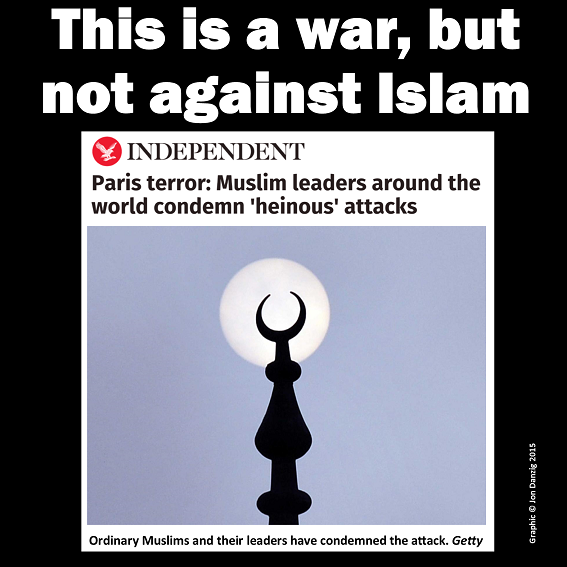 This is not a war against Islam. This is a war against religious Islamic extremism that does not represent the beliefs of most followers of Islam. Muslim leaders across the world have strongly condemned the attacks in Paris that, as of writing, have left 127 people brutally murdered and around 80 critically injured and fighting for their lives. As reported by The Independent, Iran’s president Hassan Rouhani described the attacks as a “crime against humanity”. In the UK, leader of the Muslim Council of Great Britain Dr Shuja Shafi, condemned the attacks “in the strongest possible terms,” labelling them “horrific and abhorrent”. The view that Islam is not the enemy is shared and echoed by the leaders of democratic countries across world, including Barack Obama and David Cameron. “We are not at war with Islam. We are at war with people who have perverted Islam,” said President Obama earlier this year. There are many verses in the Qur'an that demonstrate Islam as a religion of peace and forgiveness, and indeed most Muslims across the world are peaceful and forgiving. In Qur'an 24:22 Allah commands, "… They should rather pardon and overlook. Would you not love Allah to forgive you? Allah is Ever-Forgiving, Most Merciful." The Qur'an teaches that forgiveness is a superior moral trait. In Qur'an 42:43 it is stated, "But if someone is steadfast and forgives, that is the most resolute course to follow". Indeed, forgiveness, tolerance and compassion, those are the attributes I relate to the teachings of Islam and to all the Muslims who I personally know and count as my friends. After all, in Qur'an 3:134 it is revealed that followers, "control their rage and pardon other people". Of course, we know that all religious teachings are open to interpretation, and texts from all the religions have been used by some to justify terrible atrocities against fellow humans. Fortunately, most followers of religion choose not to interpret their religious texts in this way, but there are some - more than enough - who choose a different interpretation that is causing, and has historically caused, great bloodshed across the world. This has prompted some to claim that Islam is a fascist, violent and intolerant religion, and such commentary is helping to fuel a dangerous rise of Islamophobia and xenophobia generally. As a Humanist I try to make sense of the world using reason, experience and shared human values. I prefer to appeal to universal human qualities, particularly rationality, without resorting to the supernatural or alleged divine authority from religious texts. However, I am also careful not to insult religions or those who follow them. All the Abrahamic religions promote peace and compassion - that cannot be denied. But the Old Testament is one of the most violent books I have ever read. I have not read the Qur'an as widely, but it also promotes peace, as well as having violent passages just as in the Bible. Most Muslims choose to interpret their Qur'an as a book that promotes, endorses and compels good will to people. Unfortunately, a minority have chosen to interpret the religious texts in ways that cause great harm and suffering. That minority does not represent the views of most Muslims. We have to guard against any forms of Islamophobia. This is not a war against Islam, and we shouldn't make it one, either. Are some newspapers stirring up trouble? Thank you so much Jon, and it's very true that in every terrorist attack. Most of the Muslims got killed by ISIS.